Share fun and giggles with your children. These engaging ideas will captivate and stimulate your child’s senses and ignite your child’s thirst for learning. 1.Fingerpainting with a twist. Try different fingerpaints besides the traditional store bought kind. For example: Chocolate pudding paint. Just buy a can of ready-made pudding from the grocery store. Or Jello finger painting: Mix together 1 package of Jello and 2 Tbsp hot water in a small bowl being careful not to overmix. Let cool 5 to 10 min. before using. Paint on tin foil for a neat effect. 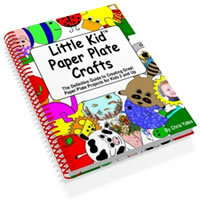 For some more edible food craft ideas visit create-kids-crafts.com. 2.Play dough. Play dough is fun to squish, squash and create with. No need to go out and buy some, there’s a great recipe below. Make an easy playdough rose for an idea: 1. Roll out a thin, long snake and press it flat. Loosely roll it up like a rug from one end to the other. Spread and press each layer out a bit. 2. For the leaves, flatten a piece of play dough with your hands. Cut out 2 leaf shapes with a plastic knife and press them onto the bottom of the rose. 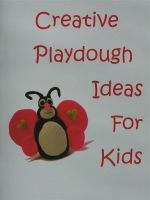 For a photo of the playdough rose and other cool playdough creations for kids(little and big) visit my web site below. 4.Oobleck. Who says small children have short attention spans? This alone fascinated my 2 yr. old at the time for 45 minutes. Recipe: 1 cup cornstarch, 1/3 cup water, 5 to 7 drops food coloring(optional). Mix water and food coloring together. Slowly add cornstarch. Do not stir. Let the mixture stand for 1 to 2 minutes. Pick a handful of the oobleck up and squeeze it until it forms a hard ball. Open your hand and the oobleck will turn from a solid back into a liquid. If it gets too dry after awhile, just add a bit more water. Mix flour, salt, oil and Kool-Aid. Add boiling water; stir and knead until cooled and smooth. Store in a plastic bag in the refrigerator. This playdough will be the color and scent of the Kool-Aid you used. Remember to supervise little kids with these ideas to ensure that with some of the ideas they don’t put things in their mouth.